St. Padre Pio (Francesco Forgione) was born to Giuseppa and Grazio Forgione, in the small farming town of Pietrelcina, Italy on May 25, 1887. Although the Forgiones were poor in material goods, they were certainly rich in their faith life and in the love of God. Even as a young boy, Francesco had already shown signs of extraordinary gifts of grace. At the age of five, he dedicated his life to God. From his early childhood, he showed a kind of recollection of spirit and a love for the religious life. His mother described him as a quiet child who, from his earliest years loved to go to church and to pray. Because he was able to see and communicate with, not only his guardian angel, but with Jesus and the Virgin Mary, as a young boy, Francesco assumed everyone had the same experiences. Once a woman who noticed his spiritual demeanor asked him, "When did you consecrate your life to God? Was it at your first Holy Communion?" and he answered, "Always, daughter, always." When he was fifteen years old, he was admitted to the novitiate of the Capuchin Order of the Friars Minor in Morcone, Italy and was admired by his Superiors and his fellow students for his exemplary behavior and his piety. One of the novices stated, "There was something which distinguished him from the other students. Whenever I saw him, he was always humble, recollected, and silent. What struck me most about Brother Pio was his love of prayer." On August 10, 1910, at the age of twenty-three, Padre Pio was ordained to the priesthood. The celebration of the Holy Mass was for Padre Pio, the center of his spirituality. Due to the long pauses of contemplative silence into which he entered at various parts of the Holy Sacrifice, his Mass could sometimes last several hours. Everything about him spoke of how intensely he was living the Passion of Christ. The parish priest in Pietrelcina called Padre Pio's Mass, "an incomprehensible mystery." When asked to shorten his Mass, Padre Pio replied, "God knows that I want to say Mass just like any other priest, but I cannot do it." His parishioners were deeply impressed by his piety and one by one, they began to come to him, seeking his counsel. For many, even a few moments in his presence, proved to be a life changing experience. As the years passed, pilgrims began to come to him by the thousands from every corner of the world, drawn by the spiritual riches, which flowed, so freely from his extraordinary ministry. To his spiritual children he would say, "It seems to me as if Jesus has no other concern but the sanctification of your soul." Padre Pio is understood above all else as a man of prayer. Before he was thirty years old, he had already reached the summit of the spiritual life known as the "unitive way" of transforming union with God. He prayed almost continuously. His prayers were usually very simple. He loved the Rosary and recommended it to others. To someone who asked him what legacy he wished to leave to his spiritual children, his brief reply was, "My child, the Rosary." He had a special mission to the souls in Purgatory and encouraged everyone to pray for them. He used to say, "We must empty Purgatory with our prayers." Padre Agostino Daniele, his confessor, director, and beloved friend said, "One admires in Padre Pio, his habitual union with God. When he speaks or is spoken to, we are aware that his heart and mind are not distracted from the thought and sentiment of God." 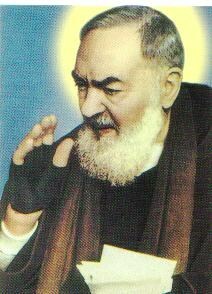 Padre Pio suffered from poor health his entire life, once saying that his health had been declining from the time he was nine years old. After his ordination to the priesthood, he remained in his hometown of Pietrelcina and separated from his religious community for more than five years due to his precarious health. Although the cause of his prolonged and debilitating illnesses remained a mystery to his doctors, Padre Pio did not become discouraged. He offered all of his bodily sufferings to God as a sacrifice, for the conversion of souls. He experienced many spiritual sufferings as well. "I am fully convinced that my illness is due to a special permission of God," he said. Shortly after his ordination, he wrote a letter to his spiritual director, Padre Benedetto Nardella, in which he asked permission to offer his life as a victim for sinners. He wrote, "For a long time I have felt in myself a need to offer myself to the Lord as a victim for poor sinners and for the souls in Purgatory. This desire has been growing continually in my heart so that it has now become what I would call a strong passion . . . It seems to me that Jesus wants this." The marks of the stigmata, the wounds of Christ, appeared on Padre Pio's body, on Friday, September 20, 1918, while he was praying before a crucifix and making his thanksgiving after Mass. He was thirty-one years old and became the first stigmatized priest in the history of the Church. With resignation and serenity, he bore the painful wounds for fifty years. In addition, God endowed Padre Pio with many extraordinary spiritual gifts and charisms including the gift of healing, bilocation, prophecy, miracles, discernment of spirits, the ability to abstain beyond man's natural powers from both sleep and nourishment, the ability to read hearts, the gift of tongues (the ability to speak and understand languages that he had never studied), the gift of conversions, levitation, multiplication of food, the grace to see his guardian angel and other angelic beings in form, and the fragrance which emanated from his wounds and which frequently announced his invisible presence. When a friend once questioned him about these charisms, Padre Pio said, "You know, they are a mystery to me, too." Although he received more than his share of spiritual gifts, he never sought them, never felt worthy of them. He never put the gifts before the Giver. He always remained humble, constantly at the disposal of Almighty God. His day began at 2:30 a.m. when he would rise to begin his prayers and to make his preparation for Mass. He was able to carry on a busy apostolate with only a few hours of sleep each night and an amount of food that was so small (300-400 calories a day) that his fellow priests stated that it was not enough food even to keep a small child alive. Between Mass and confessions, his workday lasted 19 hours. He very rarely left the monastery and never took even a day's vacation from his grueling schedule in 51 years. He never read a newspaper or listened to the radio. He cautioned his spiritual children against watching television. In his monastery in San Giovanni Rotondo, he lived the Franciscan spirit of poverty with detachment from self, from possessions, and from comforts. He always had a great love for the virtue of chastity, and his behavior was modest in all situations and with all people. In his lifetime, Padre Pio reconciled thousands of men and women back to their faith. The prayer groups that Padre Pio established have now spread throughout the world. He gave a new spirit to hospitals by founding one, which he called "The Home for the Relief of Suffering." He saw the image of Christ in the poor, the suffering, and the sick and gave himself particularly to them. He once said, "Bring God to all those who are sick. This will help them more than any other remedy." Serene and well prepared, he surrendered to Sister Death on September 23, 1968 at the age of eighty-one. He died as he had lived, with his Rosary in his hands. His last words were Gesú, Maria - Jesus, Mary - that he repeated over and over until he breathed his last. He had often declared, "After my death I will do more. My real mission will begin after my death." In 1971, Pope Paul VI, speaking to the superiors of the Capuchin order, said of Padre Pio, "What fame he had. How many followers from around the world. Why? Was it because he was a philosopher, a scholar, or because he had means at his disposal? No, it was because he said Mass humbly, heard confessions from morning until night and was a marked representative of the stigmata of Our Lord. He was truly a man of prayer and suffering." In one of the largest liturgies in the Vatican's history, Pope John Paul II canonized Padre Pio on June 16, 2002. During his homily, John Paul recalled, how, in 1947, as a young priest he journeyed from Poland to make his confession to Padre Pio. "Prayer and charity-this is the most concrete synthesis of Padre Pio's teaching," the Pope said. Drawing approximately 8 million pilgrims each year, San Giovanni Rotondo, where St. Padre Pio lived and is now buried, and is second only to the shrine of Our Lady of Guadalupe in Mexico in its number of annual visitors. St. Padre Pio's whole life might be summed up in the words of St. Paul to the Colossians, "Now I rejoice in my sufferings for your sake and in my flesh I complete what is lacking in Christ's afflictions for the sake of his body, that is, the Church."